Nylatech Power 6: Often used for drive gears, sprockets, and high load rollers and wheels, Nylatech Power 6 is as strong as steel with the abrasion resistance and noise reduction of nylon. 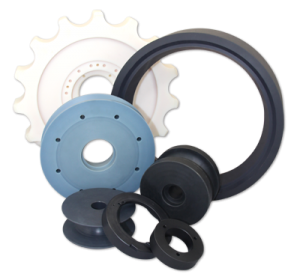 Nylatech PVM: A versatile cast nylon, Nylatech PVM (Pressure/Velocity/Maximum) is commonly used in high speed bushing and sliding applications. 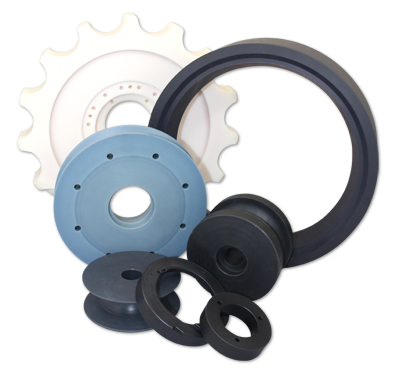 It is self lubricating with the lowest coefficient of friction of any type 6 nylon. Nylatech Moly Oil: This hybrid between Nylatech MD and OIL, is suited for high load - low RPM applications and a suitable replacement for MD in heavy duty friction generating applications. Nylatech specializes in the manufacturing of cast nylon 6 and 6/12. We can produce all your stock shape needs including tubular bar, rod, and plate stock. We also have semi-finished and finished custom cast components available for increased savings and quick turnarounds. Compare these and other Nylatech cast nylon plastics on our website or contact us for a one-on-one consultation to pick the right plastic for your next project.